Snapshots of Life: New Target for Herpes Treatment? Something about this image reminds me of that wacky and infectious old song: “It was a one-eyed, one-horned, flyin’ purple people eater …” Of course, this purple blob isn’t a people eater, but it does happen to be infectious. What you see here is a 3D rendering of a protein that the herpes simplex virus 1 (HSV-1)—one of two herpes viruses that cause genital herpes and cold sores—depends upon to infect human cells. When a cell is infected with HSV-1, the virus inserts its DNA into human cells, periodically coming out of dormancy to make more copies of itself. However, errors sometimes occur when the DNA is replicated. When that happens, an HSV-1 protein, dubbed infected cell protein 8 (ICP8), stitches broken pieces of DNA back together. 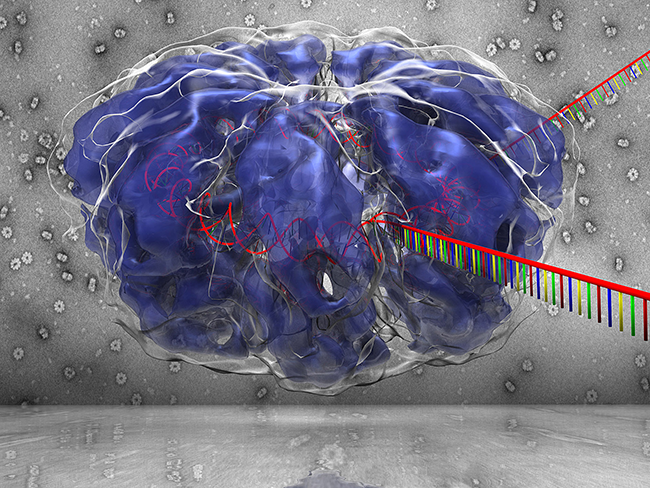 That’s what you see depicted in this schematic, which shows two single strands of DNA (red with multicolor bases) entering an ICP8 complex (purplish blue) to be reannealed into DNA’s familiar double-stranded helix (red). It’s important to keep in mind that scientists don’t yet know exactly how ICP8 reassembles DNA. This image, which is one of the winners of the Federation of American Societies for Experimental Biology’s 2014 BioArt competition, models just one potential mechanism. Still, it’s an impressive achievement. Now a postdoctoral fellow at NIH’s National Cancer Institute, Gökhan Tolun produced this image while in Jack Griffith’s lab at the University of North Carolina, Chapel Hill. Tolun started with many 2D electron microscope images of HSV-1 bound to DNA (those are the very small structures you can see in the background) and used them to generate the 3D structure via sophisticated computational analyses. If you’d like to see more of Tolun’s work, check out this very cool animation that depicts another possible mode of ICP8-mediated DNA repair. Once infected, human cells aren’t able to rid themselves of herpes virus. Treatments can help prevent outbreaks of symptoms, but there currently is no cure for the more than 750,000 Americans infected with herpes every year. Researchers think ICP8 may prove to be a useful new target for fighting herpes. So, the models that Tolun and his colleagues have created are not only are striking pieces of scientific art—they offer promising molecular insights for all who await new anti-viral strategies. herpes is the one of the worst viruses that people have. It is sad that we don’t have effective treatment products today, because all of them offer temporary help. But i hope scientists develop effective ways to treat herpes.